My students all sit around one desk otherwise known as the kitchen table. Here are some tools that we use. 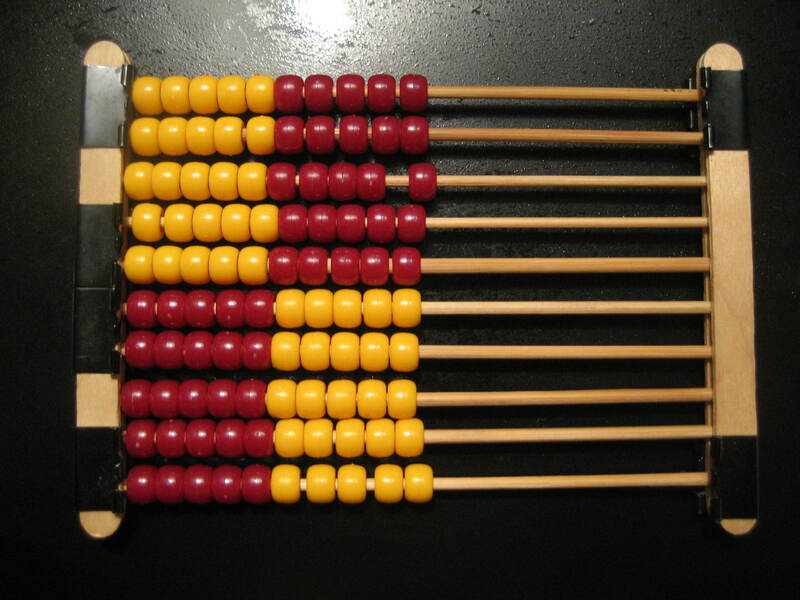 This is an American abacus and a mini version of the abacus used with RightStart Math. Our mini-abacus gets used most when we travel or when the little sister wants her own abacus during school. But it works for everyday use too. I believe that RightStart used to sell kits to make these, but I don’t think they are available anymore. So here are some directions to make your own. Start by cutting your skewers in half (I used the mini saw on my husbands Swiss Army knife). 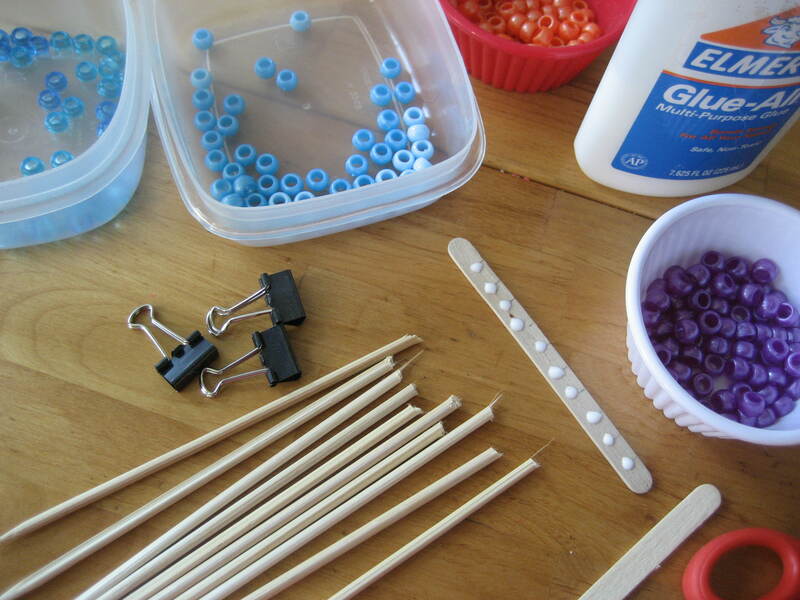 Be sure that the beads slide all the way up and down the skewer before you start gluing. Next glue 10 skewers evenly spaced to a popsicle stick and then glue another popsicle stick on top to hold one end in place. Now slide all your beads on in color blocks of 5 down the first 5 skewers. Reverse the color pattern for the next 5 skewers. Glue the popsicle sticks to the other end and clamp with the mini binder clips removing the metal prongs. 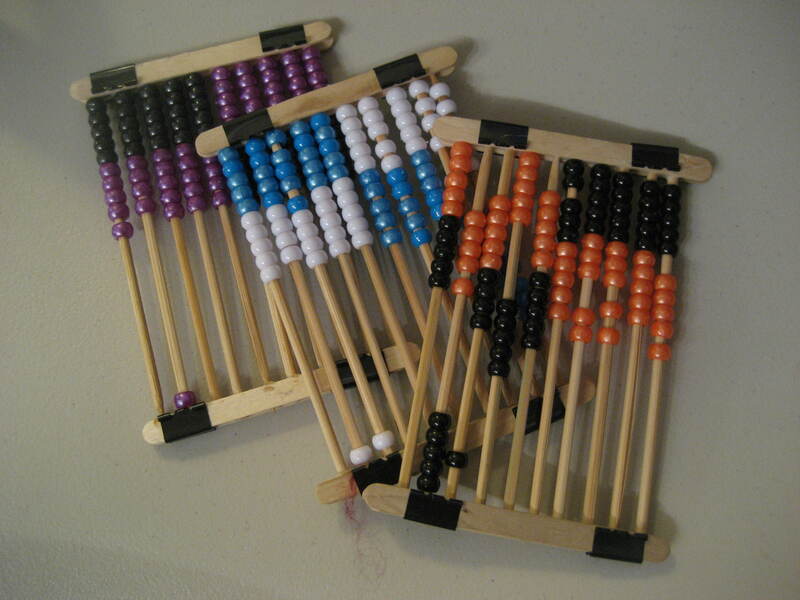 If you want you can space the clips on one end as shown above and put a little sticker on the back marking the place value as is done on the regular AL abacus. Otherwise just four clips at either end is sufficient. Once the glue is dry, your little mathemetician can perform calculations with their new abacus to his heart’s delight. 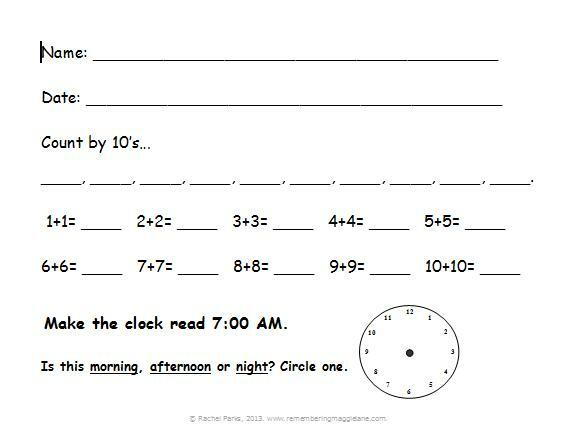 I use these worksheets first thing in the morning in place of the Meeting Book pages that go along with Saxon math. I tailor them to the skills that my kids need extra practice in. We used these worksheets near the last half of Saxon 1 and continuing on into Saxon 2. The skills focus on the student writing his/her name, date (month, day, year), math skills (counting, math facts, measuring), and clock skills. Feel free to download these Word documents for your personal use and modify them to fit the needs of your child(ren). These may be reproduced freely, but not sold. They are designed to be used on a four day cycle. So, certain skills repeat once per week and advance in difficulty over time. More worksheets to be added later…. These charts are designed to give extra practice reading and writing numbers. The first chart in the list (Master Copy) is completely filled in. The charts that follow have some numbers missing for the student to fill in with the correct number. These Word documents may be freely reproduced for student use. These may not be sold. Feel free to modify them to fit your needs. 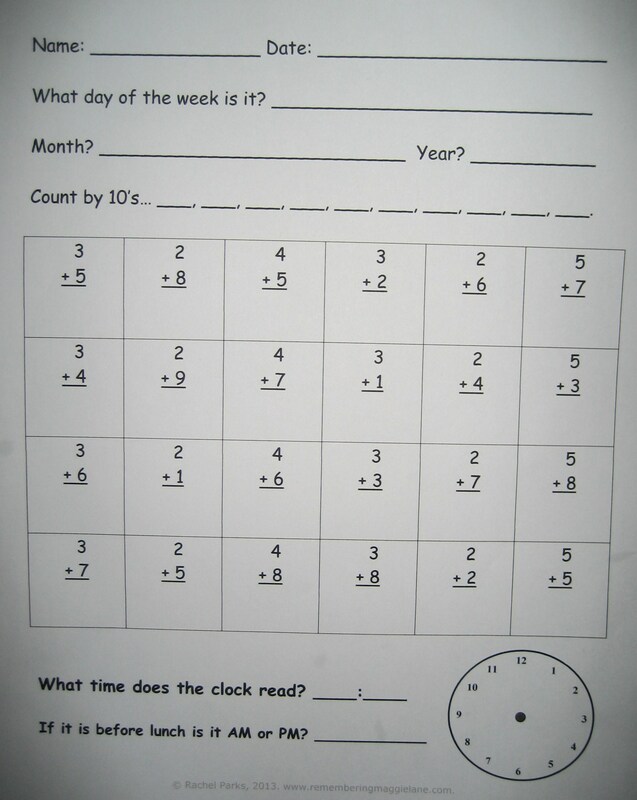 I use these morning sheets 3 days a week to help my children review their addition facts (1-9), counting, days of the week, months of the year and clock skills. Feel free to print them and use them yourself. We’ve been using them alongside Saxon 2. All you need to do after you print them is to fill in the hands on the clock.